Not quite as sneaky as their cousins the slugs, and a little more attractive, snails are nevertheless dahlia pests you don't want around your garden. Chances are that the culprit involved in garden damage, at least in the Pacific Northwest, is an alien species that was introduced, though unintentionally, to the area. Some of the alien snails arrive in plant shipments or containers, and some were originally imported intentionally, as in the case of the brown garden snail, Cornu aspersa. In a Cooperative Extension bulletin from Oregon State University discussing these dahlia pests, Robin Rosetta notes that while it's appropriate to appreciate the native snails of the Northwest, "when it comes to alien snails, xenophobia might be helpful." Rosetta's mild bout of French-bashing comes from the observation that this immigrant is the snail you'll find prepared with butter and garlic in upscale French restaurants now that the true escargot is diminished to the danger point in much of Europe. C. asperses is reputed to cost California agriculture between $7 and $10 million a year. Voracious and tenacious, it eats almost anything and commonly climbs trees and shrubs to get at tender foliage. (Yes, this is the one I swear dropped from the fig tree onto my bait-ringed dahlias.) "An alert citizenry can help secure our borders from an invasion of pillaging hordes of grazing gastropods," Rosetta advises. Although the brown snails come from Mediterranean climes, they're adaptable. In extremes of hot or cold they withdraw into their shells and exude a barrier of mucus and calcium that hardens to protect them as they ride out the weather, remaining dormant until conditions are right to resume their predations. The same is true of other snails species; most of the locals have their forest niches, however, and are less likely to be troublesome to the same degree as the aliens in the garden. To rid your garden of these dahlia pests, recommendations are the same as for slugs: keeping debris to a minimum, installing copper barriers, baiting with beer, picking, salting (though we don't recommend salting an area where you're gardening), spraying pests with a mixture of 1 part ammonia to 2 parts water, and compounds using metaldehyde or iron phosphate. 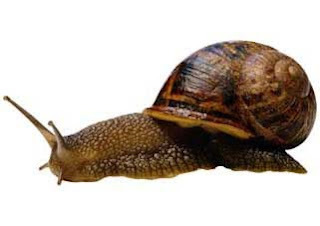 In an e-mail we received today, California resident Susan Guarino wrote, "The single best thing for snails and slugs, and it's non-toxic, is Sluggo. It's iron phosphate and breaks down to soil nutrients. It's also harmless to pets. This stuff works FAR, FAR better than the toxic options." Susan adds, "Having been an organic gardener for some 32 years now, I've been around the bug control block a few times." We're hoping to hear more from Susan—and from you!—about what works in different areas to control snails, slugs and other dahlia pests. But meanwhile, we've got one more snail-eradication option for you in our next blog.